Winter is closing in and it is time to think about holiday foods! 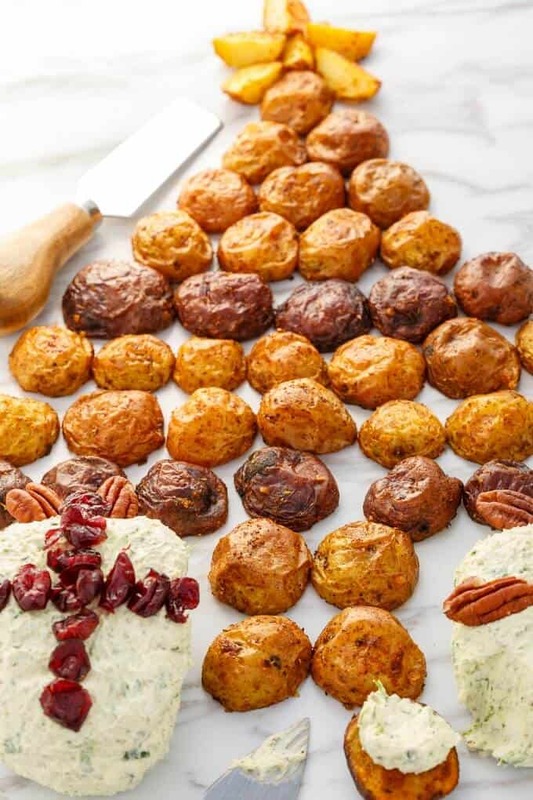 I am back with The Little Potato Company and this holiday cheese ball! 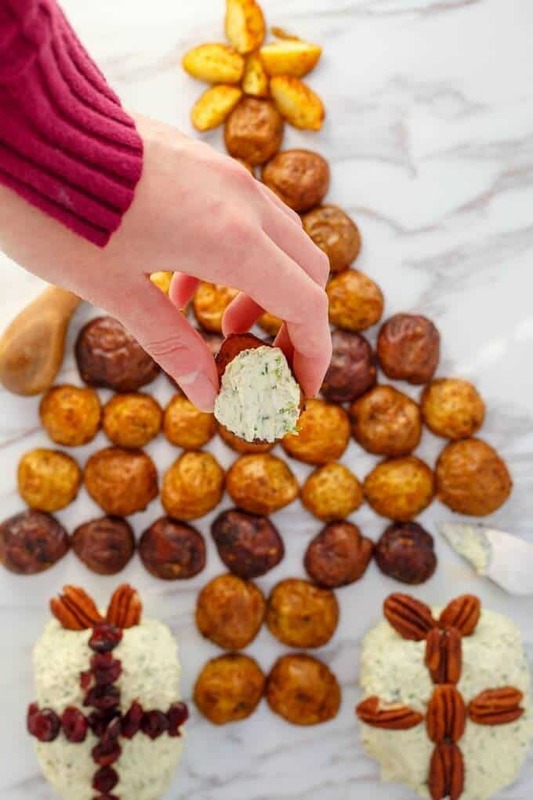 Arrange your roasted Creamer potatoes and decorate your cheese ball to represent all things holiday-related! I have a fun one today! This December marks three years of me creating Creamer potato recipes for The Little Potato Company! I cannot believe it has been three years! 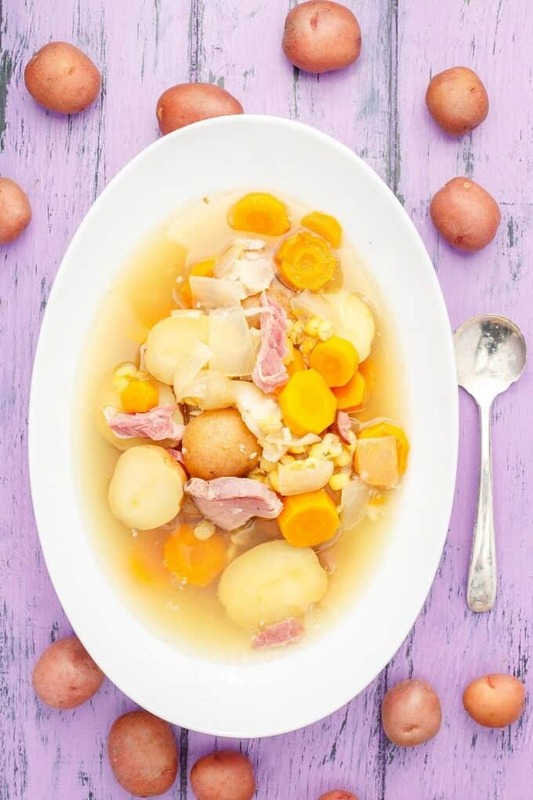 You would think by now I would have run dry of recipes, but these little potatoes are so versatile, sometimes I find it hard to pick just ONE recipe to share for the month! Looking back, my pan-fried fingerling potatoes with bacon didn’t seem anything special, but to this day they are still one of my most popular recipes! Thankfully people dismissed those horrible pictures back then and realized the recipe is a winner! Today’s holiday cheese ball uses LPC’s Terrific Trio. I went with this varietal because of the mix of colours in the bag. 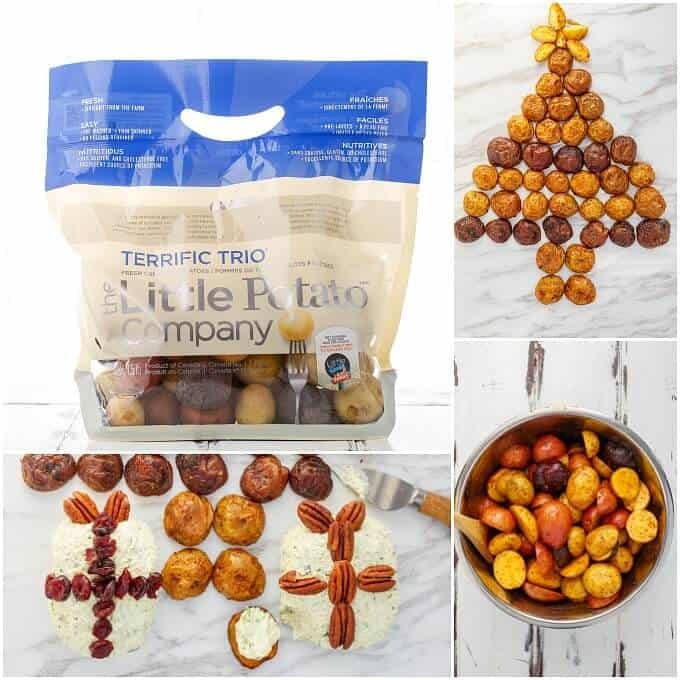 You can get really creative and fully deck out your “Christmas tree.” I would have been happy with a couple extra blue potatoes, but in the end, I am super happy with this creation! Seriously, doesn’t the whole “tree” and “presents” make you want Christmas to arrive tomorrow?! I was a little worried that the holiday cheese ball appetizer wouldn’t come off as a Christmas tree with presents, but I asked my 6 year-old daughter what she saw in the picture (she was at school when I put together the appetizer,) and she immediately recognized it as a tree with presents. So win-win! 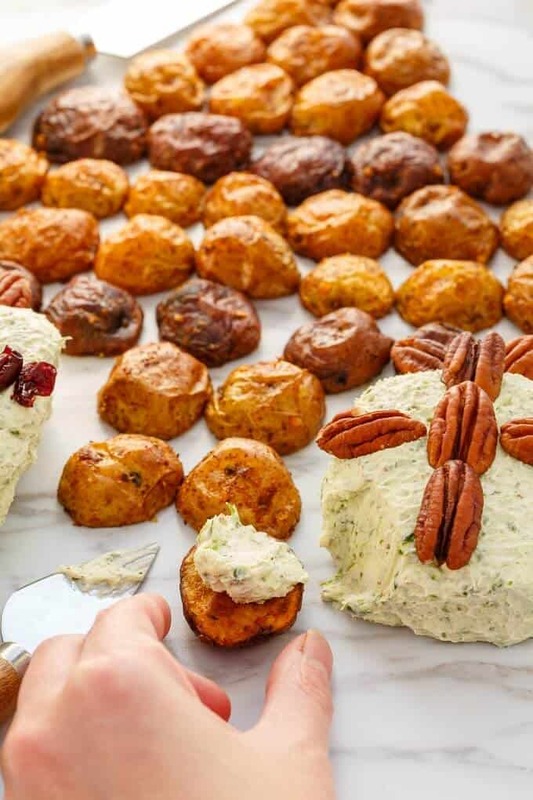 A fun holiday cheese ball appetizer that will have both kids and adults digging in! Get creative! Mix cream cheese, goat cheese, and cheddar cheese together in a large mixing bowl until nicely combined. Stir in pureed pecans, pureed spinach, and chives. Form into "presents" and decorate with additional toppings to represent wrappings and bows. Chill in refrigerator. Preheat oven to 450F. Line baking sheet with parchment paper or silicone liner. 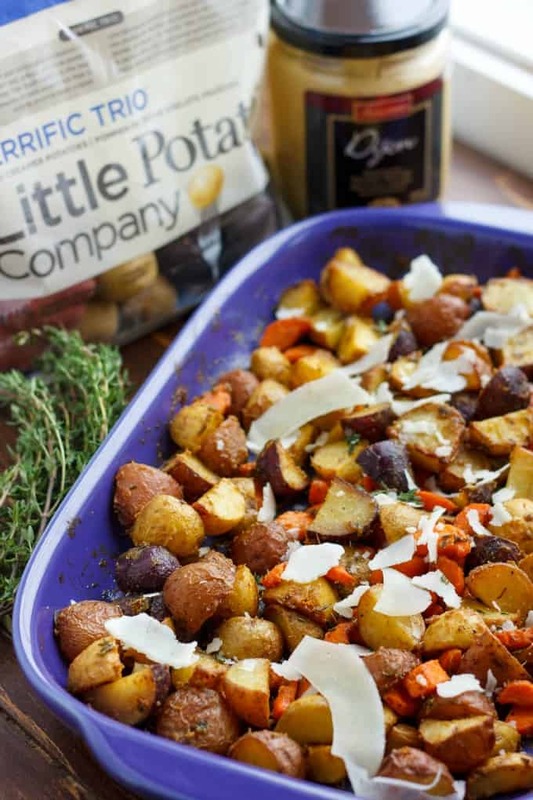 Toss potatoes, oil, and seasonings together in a large bowl until potatoes are evenly coated. Lay out in a single layer on baking sheet and roast for 20-25 minutes, tossing halfway through. Potatoes will be crispy on the outside, but soft on the inside. Arrange potatoes into two trees. If you have extra, serve them in a bowl. Cut potatoes to represent a star at the top. Place cheese balls under tree. Sprinkle with extra chives, cranberries, and/or pecans if desired!